Ibn ‘Uthaymin: We’ll never win as long as we consider the conflict between us & the jews to be a nationalistic issue. 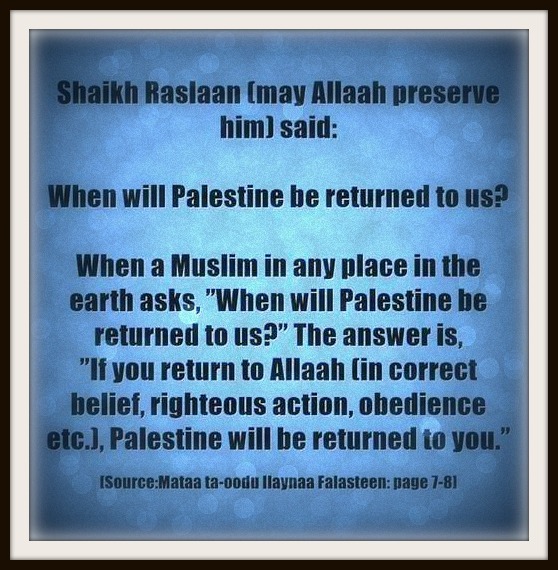 The importance of al-Quds for the Muslims – and do the Jews have any right to it? – Allaah has described it in the Qur’aan as being blessed. He said (interpretation of the meaning): “Glorified (and Exalted) be He (Allaah) Who took His slave (Muhammad) for a journey by night from Al-Masjid Al-Haraam (at Makkah) to Al-Masjid Al-Aqsaa (in Jerusalem), the neighbourhood whereof We have blessed…” [al-Israa’ 17:1]. Al-Quds is part of the neighbourhood surrounding the mosque and hence it is blessed. – In al-Quds there is al-Masjid al-Aqsaa, and one prayer there is equivalent to two hundred and fifty prayers elsewhere. It was reported that Abu Dharr (may Allaah be pleased with him) said: we were discussing, in the presence of the Prophet (peace and blessings of Allaah be upon him), which of them was more virtuous, the mosque of the Messenger of Allaah (peace and blessings of Allaah be upon him) or Bayt al-Maqdis. The Messenger of Allaah (peace and blessings of Allaah be upon him) said: One prayer in my mosque is better than four prayers there, but it is still a good place of prayer. Soon there will come a time when if a man has a spot of land as big as his horse’s rope from which he can see Bayt al-Maqdis, that will be better for him than the whole world. (Narrated and classed as saheeh by al-Haakim, 4/509. Al-Dhahabi and al-Albaani agreed with him, as stated in al-Silsilah al-Saheehah, at the end of the discussion of hadeeth no. 2902). One prayer in al-Masjid al-Nabawi is equivalent to one thousand prayers elsewhere, so one prayer in al-Masjid al-Aqsaa is equivalent to two hundred and fifty prayers elsewhere. With regard to the famous hadeeth which says that prayer in al-Masjid al-Aqsaa is equivalent to five hundred prayers elsewhere, this is da’eef (weak). (See Tamaam al-Minnah [?] by Shaykh al-Albaani – may Allaah have mercy on him – p. 292). – The one-eyed Dajjaal (“Antichrist”) will not enter it, because of the hadeeth, “He will prevail over all the earth, apart from al-Haram [in Makkah] and Bayt al-Maqdis.” (Narrated by Ahmad, 19665. Classed as saheeh by Ibn Khuzaymah, 2/327, and Ibn Hibbaan, 7/102). – The Dajjaal will be killed close to al-Quds. He will be killed by the Messiah ‘Eesa ibn Maryam (peace be upon him), as was stated in the hadeeth: “The son of Maryam will kill the Dajjaal at the gates of Ludd.” (Narrated by Muslim, 2937, from the hadeeth of al-Nawwaas ibn Sam’aan). Ludd (Lod) is a place near Bayt al-Maqdis. – The Messenger (peace and blessings of Allaah be upon him) was taken to Bayt al-Maqdis on his Night Journey (al-Israa’) from al-Masjid al-Haraam to al-Masjid al-Aqsaa. Allaah says (interpretation of the meaning): “Glorified (and Exalted) be He (Allaah) Who took His slave (Muhammad) for a journey by night from Al-Masjid Al-Haraam (at Makkah) to Al-Masjid Al-Aqsaa (in Jerusalem)…” [al-Israa’ 17:1]. – It (al-Quds) was the first qiblah of the Muslims, as was reported by al-Baraa’ (may Allaah be pleased with him): the Messenger of Allaah (peace and blessings of Allaah be upon him) prayed in the direction of Bayt al-Maqdis for sixteen or seventeen months. (Narrated by al-Bukhaari, 41 – this version was narrated by him – and by Muslim, 525). – It is the place where Wahy (Revelation) came down, and it is the homeland of the Prophets. This is well known. – It is one of the mosques to which people may travel. Abu Hurayrah (may Allaah be pleased with him) reported that the Prophet (peace and blessings of Allaah be upon him) said: “No journey should be made except to three mosques, al-Masjid al-Haraam, Masjid al-Rasool (peace and blessings of Allaah be upon him) and Masjid al-Aqsaa.” (Narrated by al-Bukhaari, 1132. Also narrated by Muslim, 827, from the hadeeth of Abu Sa’eed al-Khudri, with the words, “Do not travel except to…”). – The Messenger (peace and blessings of Allaah be upon him) led the Prophets in one prayer in al-Aqsaa, as reported in the lengthy hadeeth: “… Then the time for prayer came, and I led them in prayer.” (Narrated by Muslim, 172, from the hadeeth of Abu Hurayrah). It is not permissible to travel to any spot on earth for the purpose of worshipping there, except these three mosques. The fact that Ya’qoob (peace be upon him) built al-Masjid al-Aqsaa does not mean that the Jews have more right to the mosque than the Muslims, because Ya’qoob was a monotheist and the Jews are mushrikeen. The fact that their father Ya’qoob built the mosque does not mean that it belongs to them. He built it for the monotheists to worship in it, even if they were not his children, and he did not allow the mushrikeen to enter it, even if they are his children, because the call of the Prophets has nothing to do with race; it is based on taqwaa (piety, awareness of Allaah). Your saying that the Prophet (peace and blessings of Allaah be upon him) led the previous Prophets in prayer to signify the unity of the message and all divine revelations is correct from the point of view of the origin of the religion and ‘aqeedah (belief) of the Prophets. All of the Prophets received their Message from one source, which was the Wahy (Revelation), and they all had the same ‘aqeedah, which was the belief in Tawheed (absolute unity of Allaah) and the worship of Allaah Alone, even though there were differences in the details of their laws. This was confirmed by our Prophet (peace and blessings of Allaah be upon him) when he said: “I am the closest of mankind to ‘Eesaa ibn Maryam in this world and in the Hereafter. The Prophets are brothers although they have different mothers, and their religion is one.” (Narrated by al-Bukhaari, 3259; Muslim, 2365). The phrase “brothers although they have different mothers” means brothers who have the same father but different mothers, i.e., they are the children of co-wives. Here we would caution readers against believing that the Jews, Christians and Muslims are following the same principles nowadays, because the Jews have changed the religion of their Prophet. Indeed, part of the religion of their Prophet is that they should follow our Prophet and not reject him, but they disbelieve in the Prophethood of Muhammad (peace and blessings of Allaah be upon him) and associate others in worship with Allaah. 1. The Jews disbelieved and are no longer following the religion of the believers among the Children of Israel who followed and supported Moosa and ‘Eesaa (peace be upon them). Hence if some Arabs came who were not followers of Islam and they ruled the land with kufr, they would have to be fought until they submitted to the rule of Islam or were killed. It is not the matter of race or ethnicity; it is the matter of Tawheed and Islam. (al-Suhyooniyyah, Nash’atuhaa, Tanzeemaatuhaa, Inshitatuhaa, by Ahmad al-‘Awadi, p. 7). Hence it is clear that the Jews have no right to the land, whether according to religious law or in terms of who lived there first and possessed the land. They are aggressors who are seizing the land by force. We ask Allaah to rid Bayt al-Maqdis of them sooner rather than later, for He is Able to do that and He is Most Generous in answering. Praise be to Allaah, the Lord of the Worlds.